Skill up and coach ALL your staff for the whole year with on-demand video training and live-streamed events with our experts. Track their progress and vastly improve digital skills across your organisation with ease. All your staff confident from just £165. Beat that! >> Get The Right Package Now! Get your whole organisation savvy in under an hour of online training! I very much enjoyed the trainer! Sonny was enthusiastic, clear and helpful. Thanks so much. So many ideas to take away and use in my daily life. My team feels way more confident now! I was worried getting all our staff and governors using Teams would take years. It took 2 weeks. What's included in the Microsoft Box Set? We now call on schools, businesses and technology developers to realise the huge potential of technology to transform our schools so that teachers have the time to focus on teaching, their own professional development, and - crucially - are able to cater to the needs of every single one of their pupils. 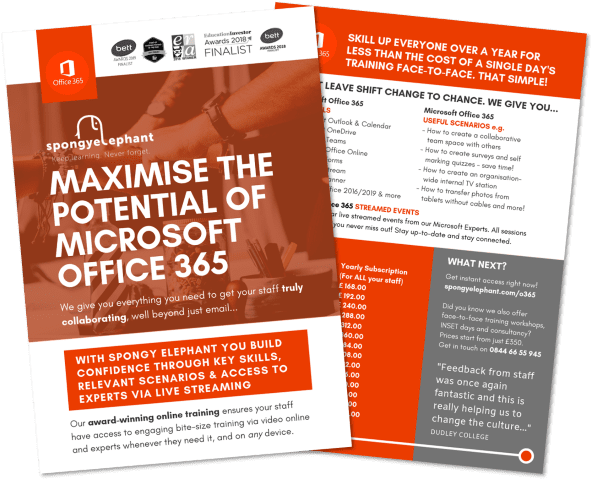 Microsoft Office 365 online training on Spongy Elephant gives you everything you need to ensure you do more than just use email. You get Outlook, Calendar, Teams, OneDrive, Sway, Office Online and much much more to get your organisation communicating and collaborating better. Click on the brochure for more details and pricing. We're so convinced that you'll enjoy how we train people online, that you can have the Microsoft Office 365 Learning Trunk for FREE! Sign up below and you'll get full access to Microsoft Outlook & Microsoft Calendar training on Spongy Elephant. This is so that you can log back in. Good interactive session, very useful tips.